We are so happy you've stopped by to visit our page! Our cattery specializes in beautiful Persian, Exotics, & Himalayan kittens We are located in the country just outside of Wichita, Kansas. Our kittens are hand-raised in the countryside on 5 acres. They are all CFA registered. They will come to you litter trained, with a vet check, their first round of shots, and a one-year health guarantee. They are loved and hugged by our family and ready to be the perfect pet you've always dreamed of owning! 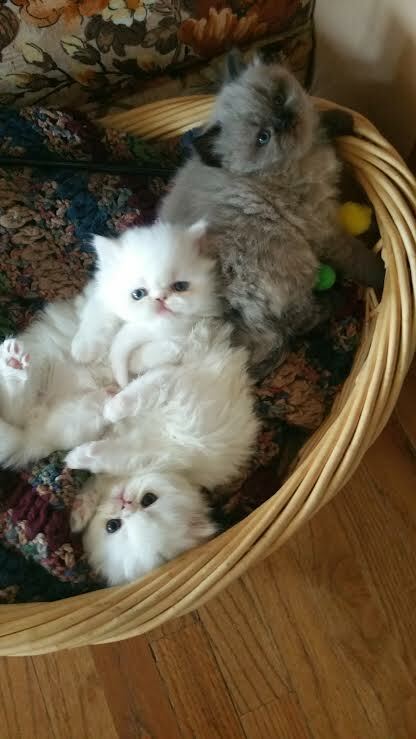 Everyone has their favorite type of kitten and we are blessed to have both flat-faced and doll faced Persian kittens in our line. We also have a variety of gorgeous colors to choose from including solid whites, blacks, blue greys, and creams; silvers, shaded silvers, tabbies, torties, and Himalayans. Persian personalities are sweet and affectionate. Many are lap kitties and love to sleep near you. Himalayans are a hybrid mix of Persian and Siamese cats. Over the years, expert breeders have created this elegant cat. Some say they are Persians dressed in Siamese drag! Himalayans have the short, cobby body, the flatter face, and the longer, thicker coat of a Persian, yet they have the markings (points), and the blue eyes of a Siamese. Himalayans come in different point colors. Point colors can be Seal (dark brown), Chocolate (warm brown), flame (red), blue (grey), cream, plus more. Exotics come in both short hair and long hair. They have all the characteristics of a Persian except the hair is usually shorter and does not require as much upkeep. They are nicknamed the "Lazy Man's Persian". Exotics are also CFA registered and because of their high demand are a higher priced kitten. Proud to be a Cat Kingpin certified breeder!